THE MOTOWN SOUNDS OF TOUCH,......Sings,....Earth Wind and Fire!! 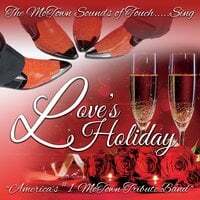 A Classic Song "Cover" of "Love's Holiday"!! Old School Pop/R&B Music at its Best! If You Like The Temptations, Earth Wind and Fire Or The Four Tops,.....You Will Love This! The Motown Sound, Pop and R&B All Included At It's Best! THE MOTOWN SOUNDS OF TOUCH,.....Singing,....Earth Wind and Fire,..."Love's Holiday"! One Of Earth Wind and Fire's All Time Great Songs! And THE MOTOWN SOUNDS OF TOUCH Version, You Are Going To Love! If You Like/Love The Temptations, The Four Tops AND Earth Wind and Fire,....Then You Will Love This Group! With also Additional Music On This EP Release,.....Music In An Old School Motown Manner,....Uptempo and Dance,...."What Is He To You?" Go Ahead,.....Listen and Enjoy! !